From a Brooklyn craft brewer, a scrap metal recycler, to an event tent designer, America's urban core is home to a host of novel, fast-growing small businesses. Here's the top 100, as ranked by the Initiative for a Competitive Inner City. For Coyote Logistics, a transportation and logistics provider in Chicago, timing is everything. Founder and CEO Jeff Silver, who launched Coyote with his own money and some private equity dollars, refers to his firm as a trucking company without the trucks. A struggling economy has contributed to Coyote's success: Silver started the company just as shippers and carriers were looking for ways to make operations more efficient. Coyote has a customer base of both big and small clients, but their employees -- most of them inner city residents -- are perhaps the company's strongest advocates. 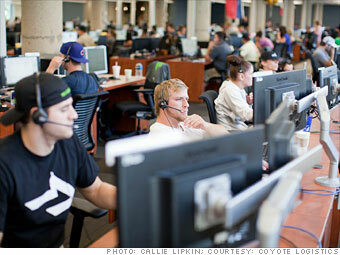 Coyote Logistics was recently named one of the best places to work in Chicago by the Chicago Tribune.